Richmond Valley offers expert pet grooming services. Our groomer, Julie, will cut, bathe, primp, and pamper both dogs and cats. Julie’s patience and experience make her the ideal groomer for all breeds, even pets who tend to get grumpy during grooming. If a patient requires sedation, Julie will work alongside one of our doctors to make sure your pet is safe. Whether you want to prepare your pet for any special occasion or you want her to look at her best, we have got it covered. We are not renowned just as professional dog boarding hospital but as excellent pet grooming service in Richmond Valley. 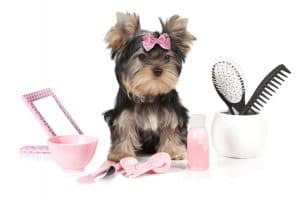 We treat each of our guests uniquely and we are well aware of the fact that a puppy’s grooming preferences are different when compared to that of an adult pooch. As a responsible pet parent, you should be aware of the importance of grooming your pet at regular instances. Grooming them essentially influences their overall well being apart from helping him look at their best. Both long and short haired pooches require special care and we at Richmond Valley Veterinary service are blessed with a dedicated team of pet professionals, who can offer tailored care for your pet. Pet care professional at Richmond Valley Veterinary care strives for excellent customer service. No wonder we have been warmly received and supported by the community. Our Google reviews speak for itself: https://goo.gl/8wR85b. If you are in search of a top-notch experience when it comes to grooming your dog, we got the whole package. Ensure that your furry friend is treated the right way as he deserves. The process of cleaning the coat and the coat entangles or knots to ensure a clean and healthy coat. We also air blow the coat to get rid of excess dead hair and dirt. A complete grooming service for your pet tailored according to your preference. This includes special treatment with medicated and topical shampoos, prescribed by a veterinarian to alleviate the concerns of flea and ticks. Our pet groomers are trained to groom the pooch as per their breed grooming requirements. We are pioneers in domestic dog grooming. We know what your pooch needs to comfort himself from the scorching summer heat. Our pet care professionals make sure that your dog’s coat remains thick but detangled and healthy. This will essentially provide him with the warmth he requires during the cold season. We guarantee a visit to Richmond Valley Grooming will leave your pet clean comfortable, and happy.